DDA designed this PowerPoint presentation and created custom technical illustrations to accompany it for Dresser-Rand in 2014. DDA was called upon by an old client to help deliver a professional custom PowerPoint presentation that would distinguish the speaker and the brand while effectively communicating the advantages of the company's industrial valves in powerplants during an upcoming conference. The presenter wanted a PowerPoint design that would communicate the quality of the Dresser-Rand brand while being clean and uncluttered, keeping the focus on the content, where it mattered most. Three new digital illustrations would be created to illustrate key ideas, including a schematic diagram of an ethylene unit, a graph of trip throttle valve pressure drop as a function of nominal valve size, and a graph of calculated high pressure section theoretical available energy as a function of nominal valve size. DDA first established the basic PowerPoint template design, including fonts and text styles, to be used for the presentation deck. Special attention was paid to table formatting to ensure clarity from far distances. DDA incorporated relevant photographs and digitally illustrated a trip throttle valve in context, which is used near the beginning of the presentation to convey the critical nature of the component to powerplant functioning. Finally, DDA created to scientific graphs communicating the complex relationships between various forces in a powerplant turbine. 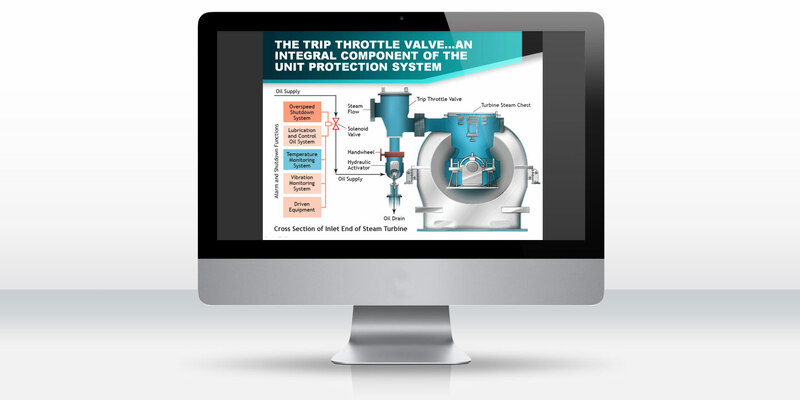 The final PowerPoint slide deck, with its sleek design, clear textual content and tables, impactful graphs, and easily understood digital illustration demonstrating a trip throttle valve in context was just what the client needed to add confidence to his presentation and effectively convey his ideas to the audience. The client testified that the presentation was well received, and helped improve a previously strained relationship. He looks forward to working with DDA on additional creative projects in the future.